this weekend my older sister's childhood best friend, who is like a second sister to me, is coming to visit us in Montreal! we have so many fun things planned: dinner tonight at a sweet little thai restaurant; a morning excursion to the famous Jean Talon market, where we will gather local, seasonal foods for a Saturday evening home-cooked meal, wine, and martinis, followed by a girls' night out (there will be lots of dancing! ); Tam Tams in the park Sunday morning; and of course, sunny daytime adventures and shopping at local shops in le plateau and mile end neighbourhoods, as well as a visit to Old Montreal. i think we might be a little ambititous in trying to squeeze TOO much in, but what matters is that we are spending long overdue girl time together.i can't wait! 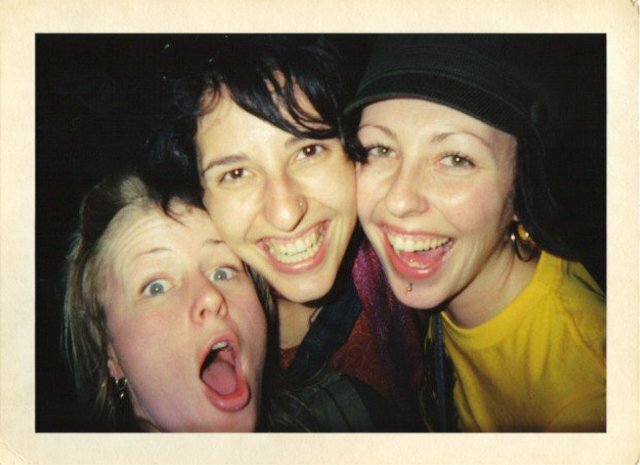 the above photo of the three of us together was taken in September 2005 at an outdoor Jack Johnson concert in Toronto. so much has happened in our lives since then and we have all grown in different ways, but no matter what, we maintain a close and honest friendship. what are your weekend plans? what, if anything, are you celebrating this weekend? whatever your plans or whatever you end up doing, may your hearts be filled with love.